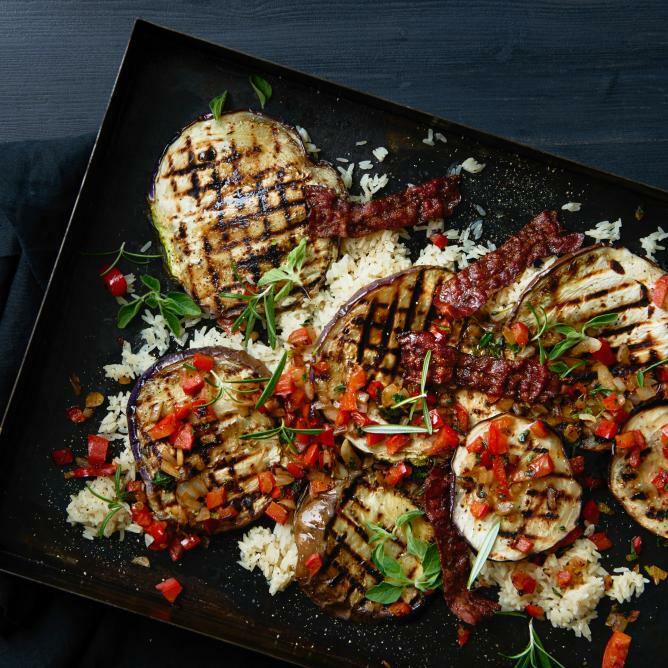 Brush both sides of the aubergine slices with oil. Heat the griddle. Grill the aubergines in batches for approx. 3 mins. on each side, season and keep warm. Warm the oil, sauté the pepper and shallot for approx. 5 mins. To make the dressing, mix together the balsamic, oil and herbs, season. Cook the rice in salted water for approx. 20 mins. until soft, drain and mix with the vegetables and the dressing. Serve the rice salad with the aubergines. Fry the bacon until crisp, serve alongside.